END OF THE YEAR BASH!! 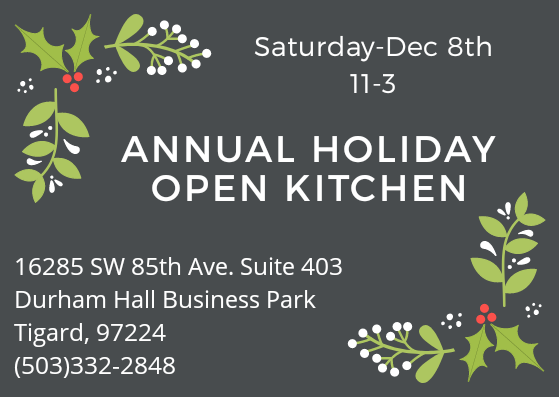 Its that time of the year for our ANNUAL HOLIDAY OPEN KITCHEN! Come join us for shopping, fun and food! Stock up on gifts and food! Check our Farmers Market Page for all the dates, locations and times! Update on the food truck: As much as the truck was so fun and we loved it so much, we have bitten off a bit too much and realized with all our markets and other ventures, we don't have the time needed to dedicate to the truck so, its up for sale. Please call or email if anyone is interested in having their own business with the best food truck ever! Its a steal because we are only asking $34,000!! Can't wait to see everyone at the markets! I will be making my rounds to each market throughout the season! We are also working on developing new soup flavors! Keep your eyes open for our 2 new sauces which should be ready for market in about a month! Spicy Arrabiata with Calabrian Chiles and Fire Roasted Tomato with Roasted Artichokes!! Yummy!!! You have some options this winter where to find our soups! You can find us every Sat at the Portland Farmers Market at PSU from 9-2. The first and third Saturday Feb-April 10-1:30 at the Beaverton Farmers Market. The second and forth Sunday in January and the first and third Sunday Feb-April at the Hillsdale Farmers Market. Our kitchen in Tigard is also open M-Th. We will have an open kitchen once a month through April. We are still working on a regular schedule for the truck. If you work at a business with more than 100 people and would like our truck to come to your business, please email or call. We are also available for parties and events!